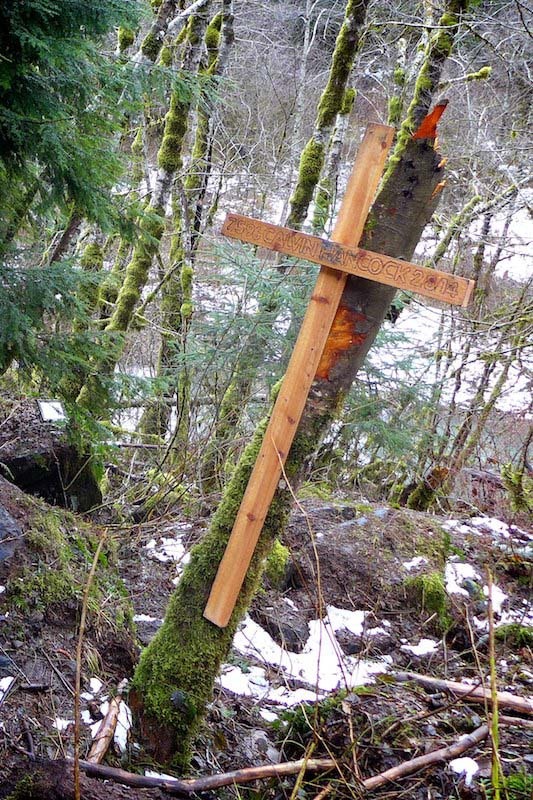 An unnecessary tragedy occurred on February 8, 2014 when a Toyota Land Cruiser going too fast heading up the Middle Fork road veered out of control, shearing off trees and coming to rest on boulders ten feet below the road bed. 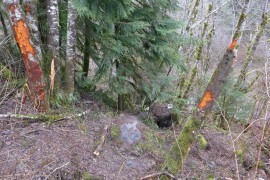 Car parts were scattered throughout the area indicating a particularly violent collision. 17-year-old Calvin Hancock was sitting in the rear passenger seat and was killed, pronounced dead at the scene. The three others in the car were brought to the hospital to be treated for injuries. The group were on their way to rescue other friends who had vehicle trouble further up the road. This road in particular is not safe for fast driving, if any are. Calvin’s mother expressed appropriate grief and anger in response to this accident as a comment to a Snoqualmie Valley Record story – “The boy who died was our son. I hope all of his classmates learn from this tragic event. Too much speed and lack of driving experience are the sole reason for what happened. Your parents aren’t trying to bother you. Your parents have experience. The next time an officer pulls you over and yells at you for being an idiot, remember that he may have just seen one of these horrible, horrible accidents and another dead teen.” Amen to that. 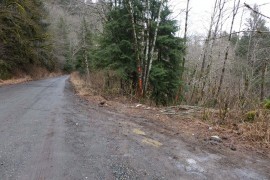 This entry was posted in Middle Fork Road and tagged car, road, SAR on 2014/02/10 by mvanderbilt. 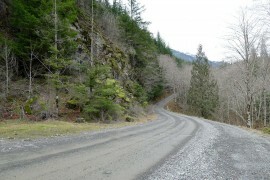 Driving too fast on the Middle Fork road can quickly turn a great day in the mountains into a nightmare. This particular accident didn’t need to happen. 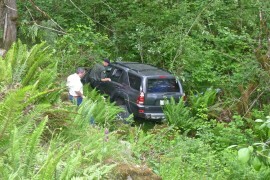 The vehicle didn’t make the turn at the most dangerous spot on the road at MP 6.7, skidded off the side and turned at least once before coming to rest right side up in the gully. This incident did not make the news so my assumption is that no-one was seriously hurt or killed. Keep your speed down! 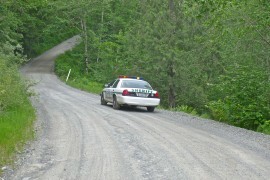 This entry was posted in Middle Fork Road and tagged car, road, SAR on 2012/06/15 by mvanderbilt. 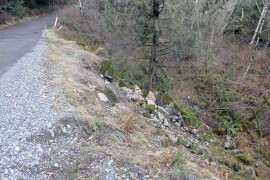 The Middle Fork has it out for cars and I’m not talking about the potholes. 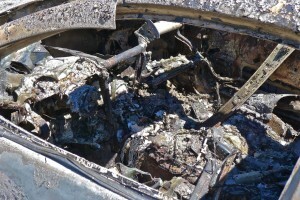 This week added another chapter to the history of cars being dumped, stolen, incapacitated, or torched. 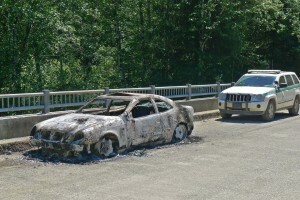 All the spur roads were closed long ago, so this Mercedes was burnt to a crisp in the middle of the concrete bridge at MP 5. 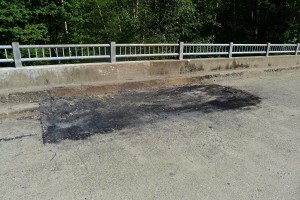 Authorities were quick to get a truck in to haul off the ashes, but it took winter storms to remove all traces of the high temperature incineration. 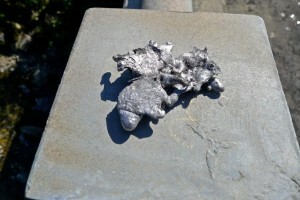 This entry was posted in Middle Fork Road and tagged car, junk, vandalism on 2011/07/23 by mvanderbilt.